I have notice that a long-standing issue, where Resilio Sync's animated icon on macOS while syncing causes high CPU usage from the WindowServer process, still has not been fixed. Through Activity Monitor, I see WindowServer using 20–40% CPU the entire time Resilio Sync is sending/receiving. This amplifies considerably the battery drain that Resilio Sync already has. You are not running High Sierra are you? I know that there has been a thread before highlighting this very issue. I thought they fixed it. Animation is hard I guess. No, I'm on Sierra. 10.12.5. This has been an issue for a long time, almost ever since I started using Sync, when it was still called BitTorrent Sync. I remember reading a thread, where there was a discussion about how the high CPU usage was caused by the animated Sync icon. Yet the developers haven't changed the Sync icon to not animate while syncing. All it would take is to create a static set of icons for the different states, and the high CPU utilization should cease for WindowServer. This is what other app developers have done, including Dropbox and even macOS itself for Time Machine backups, which used to have an animated icon. @repertor That was fixed long time ago. Which version of Sync do you use? The difference for me is I'm getting 100+% CPU usage of the "Resilio Sync" process. Also if I roll my mouse cursor over the Resilio icon on the menu bar (which does not have to be animating) the cursor will immediately turn into the typical "beach ball" spinning icon. During this time my entire machine becomes less responsive. I don't have the high CPU though. Am I seeing WindowServer using 2% CPU? Sample process - in Activity monitor right click on Sync when CPU is high -> Sample process. Save and send to support . Thanks. Yes, my apologies, I should have started my own thread. My CPU usage problem is not with WindowServer but the Resilio Sync process itself. 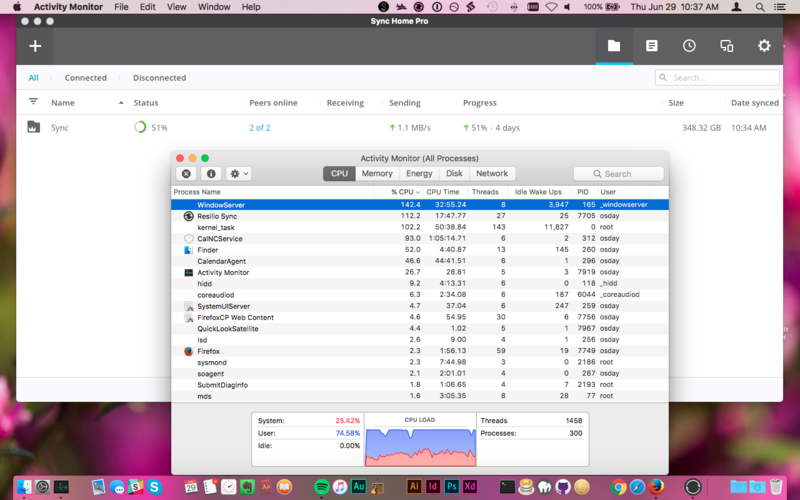 I am on a 2010 MacBook Pro, 2.4 GHz C2D, 8GB RAM. macOS Sierra 10.12.6 on SSD, while 348 GB Sync folder is on separate, internal HDD. Not only does WindowServer regularly use 20% + CPU while Sync icon is animating, Sync itself pegs my processor at max the entire time it transfers files. Why is transferring files so resource intensive? No other BitTorrent application I have ever used has used that much CPU, even while UL/DL at multiple MB per second. Sync is not necessarily "Indexing" during this time, but when it is, my computer is almost unusable. аналогичная проблема как и у других выше! A similar problem as with the others above! Looks like it's been a while since this thread was active but I have this same problem on my 2012 MacBook Air running macOS 10.14.1 (Mojave) and Resilio Sync 2.6.1. WindowServer jumps up to ~20% while the menu bar icon is animating. I tried using Vanilla to hide the icon but that didn't change CPU usage. Is this supposed to be fixed?